"Cleric" redirects here. For other uses, see Cleric (disambiguation). (left to right) George Carey, Archbishop of Canterbury (1991–2002); Jonathan Sacks, Chief Rabbi (UK); Mustafa Cerić, Grand Mufti of Bosnia; and Jim Wallis, Sojourners, United States. 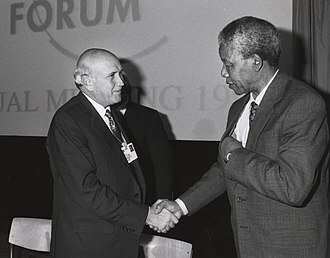 2009 World Economic Forum in Davos, Switzerland. In Christianity the specific names and roles of clergy vary by denomination and there is a wide range of formal and informal clergy positions, including deacons, elders, priests, bishops, preachers, pastors, ministers and the Pope. In Islam, a religious leader is often known formally or informally as an imam, qadi, mufti, mullah or ayatollah. In Jewish tradition, a religious leader is often a rabbi (teacher) or hazzan (cantor). The use of the word "Cleric" is also appropriate for Eastern Orthodox minor clergy who are tonsured in order not to trivialize orders such as those of Reader in the Eastern Church, or for those who are tonsured yet have no minor or major orders. It is in this sense that the word entered the Arabic language, most commonly in Lebanon from the French, as kleriki (or, alternatively, cleriki) meaning "seminarian." This is all in keeping with Eastern Orthodox concepts of clergy, which still include those who have not yet received, or do not plan to receive, the diaconate. A priesthood is a body of priests, shamans, or oracles who have special religious authority or function. The term priest is derived from the Greek presbyter (πρεσβύτερος, presbýteros, elder or senior), but is often used in the sense of sacerdos in particular, i.e., for clergy performing ritual within the sphere of the sacred or numinous communicating with the gods on behalf of the community. Buddhist clergy are often collectively referred to as the Sangha, and consist of various orders of male and female monks (originally called bhikshus and bhikshunis respectively). This diversity of monastic orders and styles was originally one community founded by Gautama Buddha during the 5th century BC living under a common set of rules (called the Vinaya). According to scriptural records, these celibate monks and nuns in the time of the Buddha lived an austere life of meditation, living as wandering beggars for nine months out of the year and remaining in retreat during the rainy season (although such a unified condition of Pre-sectarian Buddhism is questioned by some scholars). However, as Buddhism spread geographically over time - encountering different cultures, responding to new social, political, and physical environments - this single form of Buddhist monasticism diversified. The interaction between Buddhism and Tibetan Bon led to a uniquely Tibetan Buddhism, within which various sects, based upon certain teacher-student lineages arose. Similarly, the interaction between Indian Buddhist monks (particularly of the Southern Madhyamika School) and Chinese Confucian and Taoist monks from c200-c900AD produced the distinctive Ch'an Buddhism. Ch'an, like the Tibetan style, further diversified into various sects based upon the transmission style of certain teachers (one of the most well known being the 'rapid enlightenment' style of Linji Yixuan), as well as in response to particular political developments such as the An Lushan Rebellion and the Buddhist persecutions of Emperor Wuzong. In these ways, manual labour was introduced to a practice where monks originally survived on alms; layers of garments were added where originally a single thin robe sufficed; etc. This adaptation of form and roles of Buddhist monastic practice continued after the transmission to Japan. For example, monks took on administrative functions for the Emperor in particular secular communities (registering births, marriages, deaths), thereby creating Buddhist 'priests'. Again, in response to various historic attempts to suppress Buddhism (most recently during the Meiji Era), the practice of celibacy was relaxed and Japanese monks allowed to marry. This form was then transmitted to Korea, during later Japanese occupation, where celibate and non-celibate monks today exist in the same sects. (Similar patterns can also be observed in Tibet during various historic periods multiple forms of monasticism have co-existed such as "ngagpa" lamas, and times at which celibacy was relaxed). As these varied styles of Buddhist monasticism are transmitted to Western cultures, still more new forms are being created. In general, the Mahayana schools of Buddhism tend to be more culturally adaptive and innovative with forms, while Theravada schools (the form generally practised in Thailand, Burma, Cambodia and Sri Lanka) tend to take a much more conservative view of monastic life, and continue to observe precepts that forbid monks from touching women or working in certain secular roles. 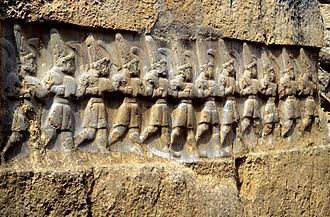 This broad difference in approach led to a major schism among Buddhist monastics in about the 4th century BCE, creating the Early Buddhist Schools. While female monastic (bhikkhuni) lineages existed in most Buddhist countries at one time, the Theravada lineages of Southeast Asia died out during the 14th-15th Century AD. As there is some debate about whether the bhikkhuni lineage (in the more expansive Vinaya forms) was transmitted to Tibet, the status and future of female Buddhist clergy in this tradition is sometimes disputed by strict adherents to the Theravadan style. Some Mahayana sects, notably in the United States (such as San Francisco Zen Center) are working to reconstruct the female branches of what they consider a common, interwoven lineage. The diversity of Buddhist traditions makes it difficult to generalize about Buddhist clergy. In the United States, Pure Land priests of the Japanese diaspora serve a role very similar to Protestant ministers of the Christian tradition. Meanwhile, reclusive Theravada forest monks in Thailand live a life devoted to meditation and the practice of austerities in small communities in rural Thailand- a very different life from even their city-dwelling counterparts, who may be involved primarily in teaching, the study of scripture, and the administration of the nationally organized (and government sponsored) Sangha. In the Zen traditions of China, Korea and Japan, manual labor is an important part of religious discipline; meanwhile, in the Theravada tradition, prohibitions against monks working as laborers and farmers continue to be generally observed. Currently in North America, there are both celibate and non-celibate clergy in a variety of Buddhist traditions from around the world. In some cases they are forest dwelling monks of the Theravada tradition and in other cases they are married clergy of a Japanese Zen lineage and may work a secular job in addition to their role in the Buddhist community. There is also a growing realization that traditional training in ritual and meditation as well as philosophy may not be sufficient to meet the needs and expectations of American lay people. Some communities have begun exploring the need for training in counseling skills as well. Along these lines, at least two fully accredited Master of Divinity programs are currently available: one at Naropa University in Boulder, CO and one at the University of the West in Rosemead, CA. In general, Christian clergy are ordained; that is, they are set apart for specific ministry in religious rites. Others who have definite roles in worship but who are not ordained (e.g. laypeople acting as acolytes) are generally not considered clergy, even though they may require some sort of official approval to exercise these ministries. Types of clerics are distinguished from offices, even when the latter are commonly or exclusively occupied by clerics. A Roman Catholic cardinal, for instance, is almost without exception a cleric, but a cardinal is not a type of cleric. An archbishop is not a distinct type of cleric, but is simply a bishop who occupies a particular position with special authority. Conversely, a youth minister at a parish may or may not be a cleric. Different churches have different systems of clergy, though churches with similar polity have similar systems. Bishop Maurício Andrade, primate of the Anglican Episcopal Church of Brazil, gives the crosier to Bishop Saulo Barros. In Anglicanism, clergy consist of the orders of deacons, priests (presbyters) and bishops in ascending order of seniority. Canon, archdeacon, archbishop and the like are specific positions within these orders. Bishops are typically overseers, presiding over a diocese composed of many parishes, with an archbishop presiding over a province, which is a group of dioceses. A parish (generally a single church) is looked after by one or more priests, although one priest may be responsible for several parishes. New clergy are ordained deacons. Those seeking to become priests are usually ordained priest after a year. Since the 1960s some Anglican churches have reinstituted the diaconate as a permanent, rather than transitional, order of ministry focused on ministry that bridges the church and the world, especially ministry to those on the margins of society. For the forms of address for Anglican clergy, see Forms of address in the United Kingdom. For a short period of history before the ordination of women as deacons, priests and bishops began within Anglicanism they could be "deaconesses". Although they were usually considered having a ministry distinct from deacons they often had similar ministerial responsibilities. In Anglican churches all clergy are permitted to marry. In most national churches women may become deacons or priests, but while fifteen out of 38 national churches allow for the consecration of women as bishops, only five have ordained any. Celebration of the Eucharist is reserved for priests and bishops. National Anglican churches are presided over by one or more primates or metropolitans (archbishops or presiding bishops). The senior archbishop of the Anglican Communion is the Archbishop of Canterbury, who acts as leader of the Church of England and 'first among equals' of the primates of all Anglican churches. Being a deacon, priest or bishop is considered a function of the person and not a job. When priests retire they are still priests even if they no longer have any active ministry. However, they only hold the basic rank after retirement. Thus a retired archbishop can only be considered a bishop (though it is possible to refer to 'Bishop John Smith, the former Archbishop of York'), a canon or archdeacon is a priest on retirement and does not hold any additional honorifics. Ordained clergy in the Roman Catholic Church are either deacons, priests, or bishops belonging to the diaconate, the presbyterate, or the episcopate, respectively. Among bishops, some are metropolitans, archbishops, or patriarchs. 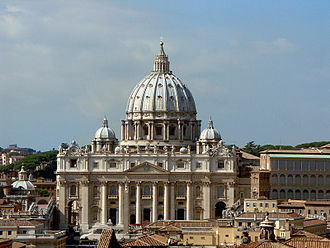 The Pope is the Bishop of Rome, the supreme and universal hierarch of the Church, and his authorization is now required for the ordination of all Catholic bishops. With rare exceptions, cardinals are bishops, although it was not always so; formerly, some cardinals were people who had received clerical tonsure, but not Holy Orders. Secular clergy are ministers, such as deacons and priests, who do not belong to a religious institute and live in the world at large, rather than a religious institute (saeculum). The Holy See supports the activity of its clergy by the Congregation for the Clergy (), a dicastery of Roman curia. 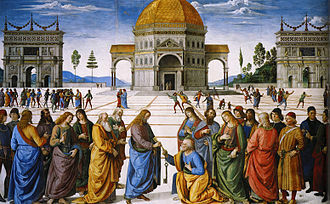 Canon Law indicates (canon 207) that "[b]y divine institution, there are among the Christian faithful in the Church sacred ministers who in law are also called clerics; the other members of the Christian faithful are called lay persons". This distinction of a separate ministry was formed in the early times of Christianity; one early source reflecting this distinction, with the three ranks or orders of bishop, priest and deacon, is the writings of Saint Ignatius of Antioch. Holy Orders is one of the Seven Sacraments, enumerated at the Council of Trent, that the Magisterium considers to be of divine institution. In the Roman Catholic Church, only men are permitted to be clerics, although in antiquity women were ordained to the diaconate[dubious – discuss]. In the Latin Church before 1972, tonsure admitted someone to the clerical state, after which he could receive the four minor orders (ostiary, lectorate, order of exorcists, order of acolytes) and then the major orders of subdiaconate, diaconate, presbyterate, and finally the episcopate, which according to Roman Catholic doctrine is "the fullness of Holy Orders". Since 1972 the minor orders and the subdiaconate have been replaced by lay ministries and clerical tonsure no longer takes place, except in some Traditionalist Catholic groups, and the clerical state is acquired, even in those groups, by Holy Orders. In the Latin Church the initial level of the three ranks of Holy Orders is that of the diaconate. In addition to these three orders of clerics, some Eastern Catholic, or "Uniate", Churches have what are called "minor clerics". Members of institutes of consecrated life and societies of apostolic life are clerics only if they have received Holy Orders. Thus, unordained monks, friars, nuns, and religious brothers and sisters are not part of the clergy. 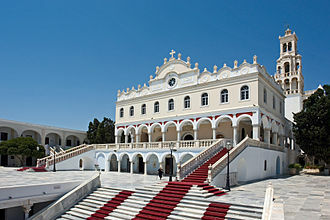 The Code of Canon Law and the Code of Canons of the Eastern Churches prescribe that every cleric must be enrolled or "incardinated" in a diocese or its equivalent (an apostolic vicariate, territorial abbey, personal prelature, etc.) or in a religious institute, society of apostolic life or secular institute. The need for this requirement arose because of the trouble caused from the earliest years of the Church by unattached or vagrant clergy subject to no ecclesiastical authority and often causing scandal wherever they went. 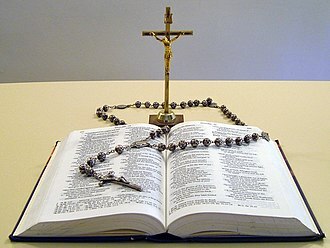 Current canon law prescribes that to be ordained a priest, an education is required of two years of philosophy and four of theology, including study of dogmatic and moral theology, the Holy Scriptures, and canon law have to be studied within a seminary or an ecclesiastical faculty at a university. Roman Catholicism mandates clerical celibacy for all clergy in the predominant Latin Rite, with the exception of deacons who do not intend to become priests. Exceptions are sometimes admitted for ordination to transitional diaconate and priesthood on a case-by-case basis for married clergymen of other churches or communities who become Catholics, but ordination of married men to the episcopacy is excluded (see personal ordinariate). Clerical marriage is not allowed and therefore, if those for whom in some particular Church celibacy is optional (such as permanent deacons in the Latin Church) wish to marry, they must do so before ordination. Eastern Catholic Churches either follow the same rules as the Latin Church or require celibacy only for bishops. The Church of Jesus Christ of Latter-day Saints (LDS Church) has no dedicated clergy, and is governed instead by a system of lay priesthood leaders. Locally, unpaid and part-time priesthood holders lead the church; the worldwide church is supervised by full-time general authorities, some of whom receive modest living allowances. No formal theological training is required for any position. All leaders in the church are called by revelation and the laying on of hands by one who holds authority. Jesus Christ stands at the head of the church and leads the church through revelation given to the President of the Church, the First Presidency, and Twelve Apostles, all of whom are recognized as prophets, seers, and revelators and have lifetime tenure. Below these men in the hierarchy are quorums of seventy, which are assigned geographically over the areas of the church. Locally, the church is divided into stakes; each stake has a president, who is assisted by two counselors and a high council. The stake is made up of several individual congregations, which are called "wards" or "branches." Wards are led by a bishop and his counselors and branches by a president and his counselors. Local leaders serve in their positions until released by their supervising authorities. Generally, all worthy males age 12 and above receive the priesthood. Youth age 12 to 18 are ordained to the Aaronic priesthood as deacons, teachers, or priests, which authorizes them to perform certain ordinances and sacraments. Adult males are ordained to the Melchizedek priesthood, as elders, seventies, high priests, or patriarchs in that priesthood, which is concerned with spiritual leadership of the church. Although the term "clergy" is not typically used in the LDS Church, it would most appropriately apply to local bishops and stake presidents. Merely holding an office in the priesthood does not imply authority over other church members or agency to act on behalf of the entire church. The Orthodox Church has three ranks of holy orders: bishop, priest, and deacon. These are the same offices identified in the New Testament and found in the Early Church, as testified by the writings of the Holy Fathers. Each of these ranks is ordained through the Sacred Mystery (sacrament) of the laying on of hands (called cheirotonia) by bishops. Priests and deacons are ordained by their own diocesan bishop, while bishops are consecrated through the laying on of hands of at least three other bishops. Within each of these three ranks there are found a number of titles. Bishops may have the title of archbishop, metropolitan, and patriarch, all of which are considered honorifics. Among the Orthodox, all bishops are considered equal, though an individual may have a place of higher or lower honor, and each has his place within the order of precedence. Priests (also called presbyters) may (or may not) have the title of archpriest, protopresbyter (also called "protopriest", or "protopope"), hieromonk (a monk who has been ordained to the priesthood) archimandrite (a senior hieromonk) and hegumen (abbot). Deacons may have the title of hierodeacon (a monk who has been ordained to the deaconate), archdeacon or protodeacon. The lower clergy are not ordained through cheirotonia (laying on of hands) but through a blessing known as cheirothesia (setting-aside). These clerical ranks are subdeacon, reader and altar server (also known as taper-bearer). Some churches have a separate service for the blessing of a cantor. Ordination of a bishop, priest, deacon or subdeacon must be conferred during the Divine Liturgy (Eucharist)—though in some churches it is permitted to ordain up through deacon during the Liturgy of the Presanctified Gifts—and no more than a single individual can be ordained to the same rank in any one service. Numerous members of the lower clergy may be ordained at the same service, and their blessing usually takes place during the Little Hours prior to Liturgy, or may take place as a separate service. The blessing of readers and taper-bearers is usually combined into a single service. Subdeacons are ordained during the Little Hours, but the ceremonies surrounding his blessing continue through the Divine Liturgy, specifically during the Great Entrance. Bishops are usually drawn from the ranks of the archimandrites, and are required to be celibate; however, a non-monastic priest may be ordained to the episcopate if he no longer lives with his wife (following Canon XII of the Quinisext Council of Trullo) In contemporary usage such a non-monastic priest is usually tonsured to the monastic state, and then elevated to archimandrite, at some point prior to his consecration to the episcopacy. Although not a formal or canonical prerequisite, at present bishops are often required to have earned a university degree, typically but not necessarily in theology. Usual titles are Your Holiness for a patriarch (with Your All-Holiness reserved for the Ecumenical Patriarch of Constantinople), Your Beatitude for an archbishop/metropolitan overseeing an autocephalous Church, Your Eminence for an archbishop/metropolitan generally, Master or Your Grace for a bishop and Father for priests, deacons and monks, although there are variations between the various Orthodox Churches. For instance, in Churches associated with the Greek tradition, while the Ecumenical Patriarch is addressed as "Your All-Holiness," all other Patriarchs (and archbishops/metropolitans who oversee autocephalous Churches) are addressed as "Your Beatitude." 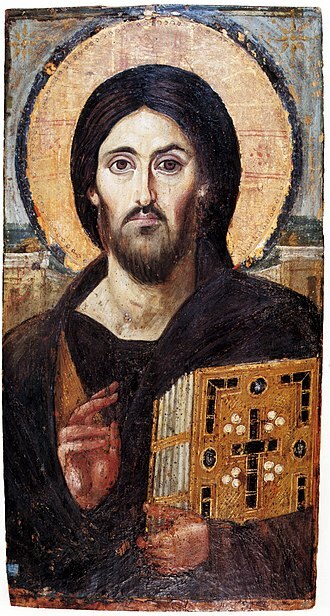 Orthodox priests, deacons, and subdeacons must be either married or celibate (preferably monastic) prior to ordination, but may not marry after ordination. Remarriage of clergy following divorce or widowhood is forbidden. Married clergy are considered as best-suited to staff parishes, as a priest with a family is thought better qualified to counsel his flock. It has been common practice in the Russian tradition for unmarried, non-monastic clergy to occupy academic posts. Clergy in Protestantism fill a wide variety of roles and functions. In many denominations, such as Methodism, Presbyterianism, and Lutheranism, the roles of clergy are similar to Roman Catholic or Anglican clergy, in that they hold an ordained pastoral or priestly office, administer the sacraments, proclaim the word, lead a local church or parish, and so forth. The Baptist tradition only recognizes two ordained positions in the church as being the elders (pastors) and deacons as outlined in the third chapter of I Timothy[1Tim 3] in the Bible. The Presbyterian Church (U.S.A.) ordains two types of presbyters or elders, teaching (pastor) and ruling (leaders of the congregation which form a council with the pastors). Teaching elders are seminary trained and ordained as a presbyter and set aside on behalf of the whole denomination to the ministry of Word and Sacrament. Ordinarily, teaching elders are installed by a presbytery as pastor of a congregation. Ruling elders, after receiving training, may be commissioned by a presbytery to serve as a pastor of a congregation, as well as preach and administer sacraments. The process of being designated as a member of the Protestant clergy, as well as that of being assigned to a particular office, varies with the denomination or faith group. Some Protestant denominations, such as Methodism, Presbyterianism, and Lutheranism, are hierarchical in nature; and ordination and assignment to individual pastorates or other ministries are made by the parent denominations. In other traditions, such as the Baptist and other Congregational groups, local churches are free to hire (and often ordain) their own clergy, although the parent denominations typically maintain lists of suitable candidates seeking appointment to local church ministries and encourage local churches to consider these individuals when filling available positions. Some Protestant denominations require that candidates for ordination be "licensed" to the ministry for a period of time (typically one to three years) prior to being ordained. This period typically is spent performing the duties of ministry under the guidance, supervision, and evaluation of a more senior, ordained minister. In some denominations, however, licensure is a permanent, rather than a transitional state for ministers assigned to certain specialized ministries, such as music ministry or youth ministry. Many Protestant denominations reject the idea that the clergy are a separate category of people, but rather stress the priesthood of all believers. Based on this theological approach, most Protestants do not have a sacrament of ordination like the pre-Reformation churches. Protestant ordination, therefore, can be viewed more as a public statement by the ordaining body that an individual possesses the theological knowledge, moral fitness, and practical skills required for service in that faith group's ministry. Some Lutheran churches form an exception to this rule, as the Lutheran Book of Concord allows ordination to be received as a sacrament. Some Protestant denominations dislike the word clergy and do not use it of their own leaders. Often they refer to their leaders as pastors or ministers, titles that, if used, sometimes apply to the person only as long as he or she holds a particular office. Sir George Fleming, 2nd Baronet, British churchman. Islam, like Judaism, has no clergy in the sacerdotal sense; there is no institution resembling the Christian priesthood. Islamic religious leaders do not "serve as intermediaries between mankind and God", have "process of ordination", nor "sacramental functions". They have been said to resemble more rabbis, serving as "exemplars, teachers, judges, and community leaders," providing religious rules to the pious on "even the most minor and private" matters. The title mullah (a Persian variation of the Arabic maula, "master"), commonly translated "cleric" in the West and thought to be analogous to "priest" or "rabbi", is a title of address for any educated or respected figure, not even necessarily (though frequently) religious. The title sheikh ("elder") is used similarly. Most of the religious titles associated with Islam are scholastic or academic in nature: they recognize the holder's exemplary knowledge of the theory and practice of ad-dín (religion), and do not confer any particular spiritual or sacerdotal authority. The most general such title is `alim (pl. 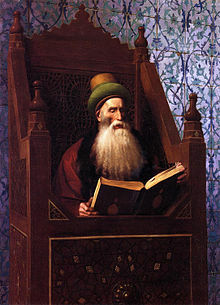 `ulamah), or "scholar". This word describes someone engaged in advanced study of the traditional Islamic sciences (`ulum) at an Islamic university or madrasah jami`ah. A scholar's opinions may be valuable to others because of his/her knowledge in religious matters; but such opinions should not generally be considered binding, infallible, or absolute, as the individual Muslim is directly responsible to God for his or her own religious beliefs and practice. The nearest analogue among Sunni Muslims to the parish priest or pastor, or to the "pulpit rabbi" of a synagogue, is called the imam khatib. This compound title is merely a common combination of two elementary offices: leader (imam) of the congregational prayer, which in most mosques is performed at the times of all daily prayers; and preacher (khatib) of the sermon or khutba of the obligatory congregational prayer at midday every Friday. Although either duty can be performed by anyone who is regarded as qualified by the congregation, at most well-established mosques imam khatib is a permanent part-time or full-time position. He may be elected by the local community, or appointed by an outside authority – e. g., the national government, or the waqf which sustains the mosque. There is no ordination as such; the only requirement for appointment as an imam khatib is recognition as someone of sufficient learning and virtue to perform both duties on a regular basis, and to instruct the congregation in the basics of Islam. The title hafiz (lit. "preserver") is awarded to one who has memorized the entire Qur'an, often by attending a special course for the purpose; the imam khatib of a mosque is frequently (though not always) a hafiz. There are several specialist offices pertaining to the study and administration of Islamic law or shari`ah. A scholar with a specialty in fiqh or jurisprudence is known as a faqih. A qadi is a judge in an Islamic court. A mufti is a scholar who has completed an advanced course of study which qualifies him to issue judicial opinions or fatawah. Iranian Shi'a cleric and author Sheikh Ali Akbar Nahavandi. In modern Shia Islam, scholars play a more prominent role in the daily lives of Muslims than in Sunni Islam; and there is a hierarchy of higher titles of scholastic authority, such as Ayatollah. Since around the mid-19th century, a more complex title has been used in Twelver Shi`ism, namely marjaʿ at-taqlid. 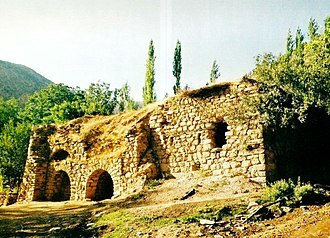 Marjaʿ (pl. marajiʿ) means "source", and taqlid refers to religious emulation or imitation. Lay Shi`ah must identify a specific marjaʿ whom they emulate, according to his legal opinions (fatawah) or other writings. On several occasions, the Marjaʿiyyat (community of all marajiʿ) has been limited to a single individual, in which case his rulings have been applicable to all those living in the Twelver Shi'ah world. Of broader importance has been the role of the mujtahid, a cleric of superior knowledge who has the authority to perform ijtihad (independent judgment). Mujtahids are few in number, but it is from their ranks that the marajiʿ at-taqlid are drawn. Indian Sufi cleric Pir-o-Murshid Ali Khan. Muslims who wish to learn Sufism dedicate themselves to a murshid's guidance by taking an oath called a bai'ah. The aspirant is then known as a murid ("disciple" or "follower"). A murid who takes on special disciplines under the guide's instruction, ranging from an intensive spiritual retreat to voluntary poverty and homelessness, is sometimes known as a dervish. 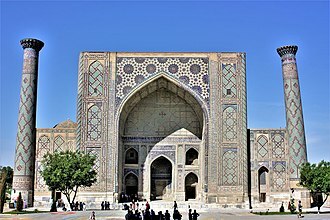 During the Islamic Golden Age, it was common for scholars to attain recognized mastery of both the "exterior sciences" (`ulum az-zahir) of the madrasahs as well as the "interior sciences" (`ulum al-batin) of Sufism. Al-Ghazali and Rumi are two notable examples. The highest office an Ahmadi can hold is that of Khalifatu l-Masih. Such a person may appoint amirs who manage regional areas. The consultative body for Ahmadiyya is called the Majlis-i-Shura, which ranks second in importance to the Khalifatu l-Masih. However, the Ahmadiyya community is declared as non-Muslims by many mainstream Muslims and they reject the messianic claims of Mirza Ghulam Ahmad. Rabbinic Judaism does not have clergy as such, although according to the Torah there is a tribe of priests known as the Kohanim who were leaders of the religion up to the destruction of the Temple of Jerusalem in 70 AD when most Sadducees were wiped out; each member of the tribe, a Kohen had priestly duties, many of which centered around the sacrificial duties, atonement and blessings of the Israelite nation. Today, Jewish Kohanim know their status by family tradition, and still offer the priestly blessing during certain services in the synagogue and perform the Pidyon haben (redemption of the first-born son) ceremony. Since the time of the destruction of the Temple of Jerusalem, the religious leaders of Judaism have often been rabbis, who are technically scholars in Jewish law empowered to act as judges in a rabbinical court. All types of Judaism except Orthodox Judaism allow women as well as men to be ordained as rabbis and cantors. The leadership of a Jewish congregation is, in fact, in the hands of the laity: the president of a synagogue is its actual leader and any adult male Jew (or adult Jew in non-traditional congregations) can lead prayer services. The rabbi is not an occupation found in the Torah; the first time this word is mentioned is in the Mishnah. The modern form of the rabbi developed in the Talmudic era. Rabbis are given authority to make interpretations of Jewish law and custom. 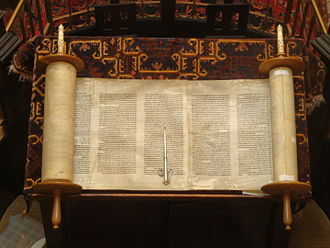 Traditionally, a man obtains one of three levels of Semicha (rabbinic ordination) after the completion of an arduous learning program in Torah, Tanakh (Hebrew Bible), Mishnah and Talmud, Midrash, Jewish ethics and lore, the codes of Jewish law and responsa, theology and philosophy. Regina Jonas, the world's first female rabbi, ordained in 1935, killed in the Holocaust in 1944. Since the early medieval era an additional communal role, the Hazzan (cantor) has existed as well. Cantors have sometimes been the only functionaries of a synagogue, empowered to undertake religio-civil functions like witnessing marriages. Cantors do provide leadership of actual services, primarily because of their training and expertise in the music and prayer rituals pertaining to them, rather than because of any spiritual or "sacramental" distinction between them and the laity. Cantors as much as rabbis have been recognized by civil authorities in the United States as clergy for legal purposes, mostly for awarding education degrees and their ability to perform weddings, and certify births and deaths. Additionally, Jewish authorities license mohels, people specially trained by experts in Jewish law and usually also by medical professionals to perform the ritual of circumcision. Traditional Orthodox Judaism does not license women as mohels, but other types of Judaism do. They are appropriately called mohelot (pl. of mohelet, f. of mohel) . As the Jewish News Weekly of Northern California states, "...there is no halachic prescription against female mohels, [but] none exist in the Orthodox world, where the preference is that the task be undertaken by a Jewish man.". 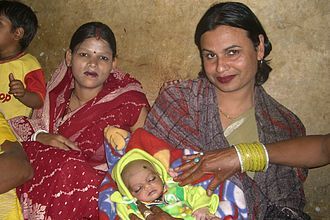 In many places, mohels are also licensed by civil authorities, as circumcision is technically a surgical procedure. Kohanim, who must avoid contact with dead human body parts (such as the removed foreskin) for ritual purity, cannot act as mohels, but some mohels are also either rabbis or cantors. Another licensed cleric in Judaism is the shochet, who are trained and licensed by religious authorities for kosher slaughter according to ritual law. A Kohen may be a shochet. Most shochetim are ordained rabbis. Then there is the mashgiach. A mashgiach is someone who supervises the kashrut status of a kosher establishment. The mashgiach must know the Torah laws of kashrut, and how they apply in the environment he is supervising. Obviously, this can vary. In many instances, the mashgiach is a rabbi. This helps, since rabbinical students learn the laws of kosher as part of their syllabus. However, not every mashgiach is a rabbi, and not every rabbi is qualified to be a mashgiach. In contemporary Orthodox Judaism, women are forbidden from becoming rabbis or cantors in the Orthodox world primarily because this would affect many aspects of communal observances and practices . Most Orthodox rabbinical seminaries or yeshivas also require dedication of many years to education, but few require a formal degree from a civil education institutions that often define Christian clergy. Training is often focused on Jewish law, and some Orthodox Yeshivas forbid secular education. In Hasidic Judaism, generally understood as a branch of Orthodox Judaism, there are dynastic spiritual leaders known as Rebbes, often translated in English as "Grand Rabbi". The office of Rebbe is generally a hereditary one, may also be passed from Rebbe to student, or recognized by a congregation conferring a sort of coronation to their new Rebbe. Although one does not need to be an ordained Rabbi to be a Rebbe, most Rebbes today are ordained Rabbis. Since one does not need to be an ordained rabbi to be a Rebbe, at some points in history there were female Rebbes as well, particularly the Maiden of Ludmir. In Conservative Judaism, both men and women are ordained as rabbis and cantors. Conservative Judaism differs with Orthodoxy in that it sees Jewish Law as binding but also as subject to many interpretations, including more liberal interpretations. Academic requirements for becoming a rabbi are rigorous. First earn a bachelor's degree before entering rabbinical school. Studies are mandated in pastoral care and psychology, the historical development of Judaism and most importantly the academic study of Bible, Talmud and rabbinic literature, philosophy and theology, liturgy, Jewish history, and Hebrew literature of all periods. Reconstructionist Judaism and Reform Judaism do not maintain the traditional requirements for study as rooted in Jewish Law and traditionalist text. Both men and women may be rabbis or cantors. The rabbinical seminaries of these movements hold that one must first earn a bachelor's degree before entering the rabbinate. In addition studies are mandated in pastoral care and psychology, the historical development of Judaism; and academic biblical criticism. Emphasis is placed not on Jewish law, but rather on sociology, modern Jewish philosophy, Theology and Pastoral Care. Sikh clergy consists of five Jathedars, one each from five takhts or sacred seats. The Jathedars are appointed by the Shiromani Gurdwara Parbandhak Committee (SGPC), an elected body of the Sikhs sometimes called the "Parliament of Sikhs." The highest seat of the Sikh religion is called Akal Takht and the Jathedar of Akal Takht makes all the important decisions after consultations with the Jathedars of the other four takhts and the SGPC. Historically traditional (or pagan) religions typically combine religious authority and political power. What this means is that the sacred king or queen is therefore seen to combine both kingship and priesthood within his or her person, even though he or she is often aided by an actual high priest or priestess (see, for example, the Maya priesthood). When the functions of political ruler and religious leader are combined in this way, deification could be seen to be the next logical stage of his or her social advancement within his or her native environment, as is found in the case of the Egyptian Pharaohs. The Vedic priesthood of India is an early instance of a structured body of clergy organized as a separate and hereditary caste, one that occupied the highest social rung of its nation. A modern example of this phenomenon the priestly monarchs of the Yoruba holy city of Ile-Ife in Nigeria, whose reigning Onis have performed ritual ceremonies for centuries for the sustenance of the entire planet and its people. In recent years, studies have suggested that American clergy in certain Protestant, Evangelical and Jewish traditions are more at risk than the general population of obesity, hypertension and depression. Their life expectancies have fallen in recent years and in the last decade their use of antidepressants has risen. Several religious bodies in the United States (Methodist, Episcopal, Baptist and Lutheran) have implemented measures to address the issue, through wellness campaigns, for example - but also by simply ensuring that clergy take more time off. It is unclear whether similar symptoms affect American Muslim clerics, although an anecdotal comment by one American imam suggested that leaders of mosques may also share these problems. One exception to the findings of these studies is the case of American Catholic priests, who are required by canon law to take a spiritual retreat each year, and four weeks of vacation. Sociological studies at the University of Chicago have confirmed this exception; the studies also took the results of several earlier studies into consideration and included Roman Catholic priests nationwide. It remains unclear whether American clergy in other religious traditions experience the same symptoms, or whether clergy outside the United States are similarly affected. ^ Douglas Harper. "cleric". Online Etymology Dictionary. ^ Douglas Harper. "clergy". Online Etymology Dictionary. ^ Douglas Harper. "clerk". Online Etymology Dictionary. ^ Paul VI, Apostolic letter motu proprio Ministeria quaedam nos. 2–4, 64 AAS 529 (1972). ^ Ministeria quaedam no. 1; CIC Canon 266 § 1. ^ CCEO Canon 327; George Nedungatt, Clerics, in A Guide to the Eastern Code 255, 260 (2002). ^ "Code of Canon Law, Canon 207". Retrieved 25 November 2011. ^ "Ministeria quaedam - Disciplina circa Primam Tonsuram, Ordines Minores et Subdiaconatus in Ecclesia Latina innovatur, Litterae Apostolicae Motu Proprio datae, Die 15 m. Augusti a. 1972, Paulus PP.VI - Paulus PP. VI". www.vatican.va. ^ "Codex Canonum Ecclesiarum orientalium, die XVIII Octobris anno MCMXC - Ioannes Paulus PP. 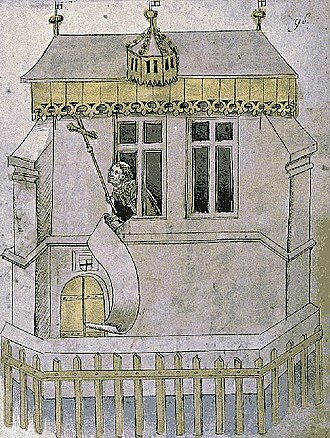 II - Ioannes Paulus II". www.vatican.va. ^ "Questions and Answers - ensign". www.lds.org. ^ The Church of Jesus Christ of Latter-day Saints, "Why Don't Mormons Have Paid Clergy? ", mormon.org. ^ "Forms of Addresses and Salutations for Orthodox Clergy - Parish & Church Life - Greek Orthodox Archdiocese of America". goarch.org. ^ Presbyterian Church (U.S.A.). Book of Order: 2009-2011 (Louisville: Office of the General Assembly), Form of Government, Chapter 6 and 14. See also "Theology and Worship" (PDF). Archived from the original (PDF) on 2004-03-07. ^ a b c Pipes, Daniel (1983). In the Path of God: Islam and Political Power. Routledge. p. 38. Retrieved 5 June 2018. ^ Brown, Jonathan A.C. (2014). Misquoting Muhammad: The Challenge and Choices of Interpreting the Prophet's Legacy. Oneworld Publications. p. 24. ISBN 978-1780744209. Retrieved 4 June 2018. ^ Islam and the Ahmadiyya Jamaʻat: History, Belief, Practice, p.93, Simon Ross Valentine, 2008. ^ "Orthodox Women To Be Trained As Clergy, If Not Yet as Rabbis –". Forward.com. Retrieved 3 September 2013. ^ "The Cantor". My Jewish Learning. Retrieved 3 September 2013. ^ a b "Making the cut | j. the Jewish news weekly of Northern California". Jweekly.com. 3 March 2006. Retrieved 3 September 2013. ^ Grandin, Temple (1980). "Problems With Kosher Slaughter". International Journal for the Study of Animal Problems. 1 (6): 375–390 – via The Humane Society of the United States. ^ Vitello, Paul. "Evidence Grows of Problem of Clergy Burnout". ^ See A. M. Greeley, Priests: A Calling in Crisis (University of Chicago Press, 2004). Sanneh, Lamin. "The origins of clericalism in West African Islam." The Journal of African History 17.01 (1976): 49-72. Collier-Thomas, Bettye. Daughters of Thunder: Black Women Preachers and Their Sermons (1997). Ruether, Rosemary Radford. "Should Women Want Women Priests or Women-Church?." Feminist Theology 20.1 (2011): 63-72. Look up clergy in Wiktionary, the free dictionary. Herbermann, Charles, ed. (1913). "Priesthood" . Catholic Encyclopedia. New York: Robert Appleton Company. "Church Administration" - The Church of Jesus Christ of Latter Day Saints. University of the West, Buddhist M.Div. The current archbishop is Justin Welby. His enthronement took place at Canterbury Cathedral on 21 March 2013, Welby is the 105th in a line which goes back more than 1400 years to Augustine of Canterbury, the Apostle to the English, sent from Rome in the year 597. From the time of Augustine in the 6th until the 16th century, during the English Reformation the Church of England broke away from the authority of the Pope and the Roman Catholic Church. 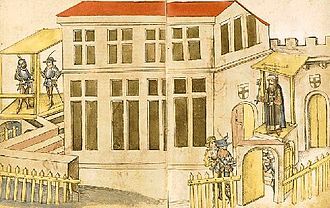 In the Middle Ages there was variation in the methods of nomination of the Archbishop of Canterbury. At various times the choice was made by the canons of Canterbury Cathedral, today the archbishop fills four main roles, He is the diocesan bishop of the Diocese of Canterbury, which covers the eastern parts of the County of Kent. Founded in 597, it is the oldest see in the English church and he is the metropolitan archbishop of the Province of Canterbury, which covers the southern two-thirds of England. He is the primate and chief religious figure of the Church of England. The Archbishop of Canterbury plays a part in national ceremonies such as coronations, due to his high public profile. As spiritual leader of the Anglican Communion, the archbishop, although without legal authority outside England, is recognised by convention as primus inter pares of all Anglican primates worldwide, since 1867 he has convened more or less decennial meetings of worldwide Anglican bishops, the Lambeth Conferences. In the last two of these functions he has an important ecumenical and interfaith role, speaking on behalf of Anglicans in England, the archbishops main residence is Lambeth Palace in the London Borough of Lambeth. He has lodgings in the Old Palace, located beside Canterbury Cathedral, as holder of one of the five great sees, the Archbishop of Canterbury is ex officio one of the Lords Spiritual of the House of Lords. He is one of the men in England and the highest ranking non-royal in the United Kingdoms order of precedence. Since Henry VIII broke with Rome, the Archbishops of Canterbury have been selected by the English monarch, today the choice is made in the name of the monarch by the prime minister, from a shortlist of two selected by an ad-hoc committee called the Crown Nominations Commission. Ayatollah is a high-ranking title given to Usuli Twelver Shī‘ah clerics. Those who carry the title are experts in Islamic studies such as jurisprudence, quran reading, the next lower clerical rank is Hujjat al-Islam. The name ayatollah originates from a passage in the Quran which the Shia, unlike the Sunni, passage 51, 20–21 of the Quran states, On the earth are signs for those of assured Faith, As in your own selves, Will ye not see. The term was not commonly used a title until the twentieth century. The title of Ayatollah became popularized with the creation of Qom Seminary in 1922 and this was a political response on behalf of the Ayatollah against the monopoly on the tobacco industry. The title is granted to top Shia mujtahid, after completing sath. By the mujtahid would be able to issue his own edicts from the sources of Islamic religious laws, the Quran, the Sunnah, ijmāʻ, most of the time this is attested by an issued certificate from his teachers. The ayatollah can teach in hawzas according to his speciality, can act as a reference for their religious questions, there are a few women who are equal in ranking to the ayatollahs, and are known as Lady Mujtahideh. Jim Wallis is a Christian writer and political activist. He is best known as the founder and editor of Sojourners magazine and as the founder of the Washington, Wallis is well known for his advocacy on issues of peace and social justice. Although Wallis actively eschews political labels, he himself as an evangelical and is often associated with the evangelical left. He worked as an advisor to President Barack Obama. He is a leader in the Red-Letter Christian movement, Wallis was born in Detroit, the son of Phyllis and James E. Wallis, Sr. He was raised in a traditional evangelical Plymouth Brethren family, as a young man Wallis became active in Students for a Democratic Society and the civil rights movement. The journal Sojourners originated in Deerfield, Illinois as The Post American in 1971, a reviewer of Wallis 1976 book Agenda for Biblical People summarized the Christological basis of Wallis political theology, Christs life and resurrection have brought victory over the powers. He shattered the myth of their authority by demonstrating his freedom in relation to them. He challenged their rule and would not submit to them, the fallen powers were so exposed and threatened by Christs actions that they acted in collusion to kill him. The cross symbolizes that freedom in which death is swallowed up in victory, Christs resurrection vindicates his manner of life and death, seats his victory, and allows others to live freely and humanly in the midst of the powers by their being in Christ. This must be the proclamation and witness of the church of Jesus Christ, the church is a new force in history which is a sign to the powers that their dominion has been broken. It is the life of a community of faith that issues a basic challenge to the world as it is. The church must be called to be the church, to rebuild the kind of community that gives substance to the claims of faith. Wallis has been quoted as saying, I would suggest that the Bible is neither “conservative” nor “liberal” as we understand those terms in a political context today. Speaking to a conference of clergy from the Anglican Diocese of Liverpool Wallis said, The press dont get it – they say, Have you replaced the religious right with the religious left. Late Latin is the scholarly name for the written Latin of Late Antiquity. The English dictionary definition of Late Latin dates this period from the 3rd to the 6th centuries AD and this somewhat ambiguously defined period fits between Classical Latin and Medieval Latin. Although there is no consensus about exactly when Classical Latin should end, nor exactly when Medieval Latin should begin. 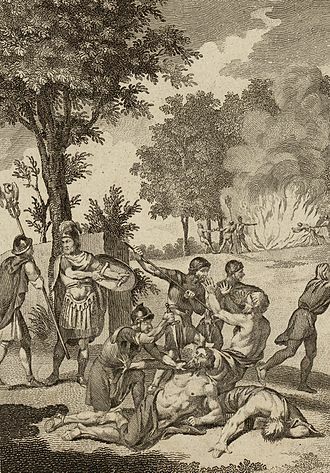 Being a written language, Late Latin is not identical with Vulgar Latin, the latter during those centuries served as proto-Romance, a reconstructed ancestor of the Romance languages. Although Late Latin reflects an upsurge of the use of Vulgar Latin vocabulary and constructs, it remains to a large extent classical in overall features, some are more literary and classical, some more inclined to the vernacular. Nor is Late Latin identical to Christian or patristic Latin, the writings of the early Christian fathers. While Christian writings are considered a subset of Late Latin, pagans wrote much Late Latin, serving as some sort of lingua franca to a large empire, Latin tended to become simpler, to keep above all what it had of the ordinary. Neither Late Latin nor Late Antiquity are modern terms or concepts, instances of English vernacular use of the term may be found from the 18th century. The term Late Antiquity meaning post-classical and pre-medieval had currency in English well before then, Imperial Latin went on into English literature, Fowlers History of Roman Literature mentions it in 1903. There are, insoluble problems with the beginning and end of Imperial Latin, politically the excluded Augustan Period is the paradigm of imperiality, and yet the style cannot be bundled with either the Silver Age or with Late Latin. 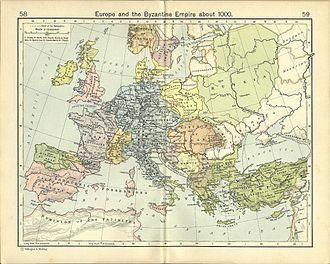 Moreover, in 6th century Italy, the Roman Empire no longer existed, subsequently the term Imperial Latin was dropped by historians of Latin literature, although it may be seen in marginal works. The Silver Age was extended a century and the four centuries represent Late Latin. Low Latin is a vague and often pejorative term that might refer to any post-classical Latin from Late Latin through Renaissance Latin depending on the author. A Christian denomination is a distinct religious body within Christianity, identified by traits such as a name, organisation and doctrine. Individual bodies, may use alternative terms to describe themselves, groups of denominations—often sharing broadly similar beliefs and historical ties—are sometimes known as branches of Christianity or denominational families. Individual Christian groups vary widely in the degree to which they recognize one another, several groups claim to be the direct and sole authentic successor of the church founded by Jesus Christ in the 1st century AD. Others, believe in denominationalism, where some or all Christian groups are legitimate churches of the same regardless of their distinguishing labels, beliefs. Because of this concept, some Christian bodies reject the term denomination to describe themselves, the Catholic Church does not view itself as a denomination, but as the original pre-denominational church. This view is rejected by other Christian denominations, Protestant denominations account for approximately 37 percent of Christians worldwide. Together and Protestantism comprise Western Christianity, Western Christian denominations prevail in Western, Northern and Southern Europe, Sub-Saharan Africa, the Americas and Oceania. The Eastern Orthodox Church, with an estimated 225–300 million adherents, is the second-largest Christian organization in the world, unlike the Catholic Church, the Eastern Orthodox Church is itself a communion of fully independent autocephalous churches that mutually recognize each other to the exclusion of others. The Eastern Orthodox Church, together with Oriental Orthodoxy and the Assyrian Church of the East, Eastern Christian denominations are represented mostly in Eastern Europe, North Asia, the Middle East and Northeast Africa. Christians have various doctrines about the Church and about how the church corresponds to Christian denominations. Both Catholics and Eastern Orthodox hold that their own organizations faithfully represent the One Holy catholic and Apostolic Church to the exclusion of the other, sixteenth-century Protestants separated from the Catholic Church because of theologies and practices that they considered to be in violation of their own interpretation. But some non-denominational Christians do not follow any particular branch, though regarded as Protestants. Each group uses different terminology to discuss their beliefs and this section will discuss the definitions of several terms used throughout the article, before discussing the beliefs themselves in detail in following sections. A denomination within Christianity can be defined as an autonomous branch of the Christian Church, major synonyms include religious group, Church. Some traditional and evangelical Protestants draw a distinction between membership in the church and fellowship within the local church. Becoming a believer in Christ makes one a member of the universal church, a related concept is denominationalism, the belief that some or all Christian groups are legitimate churches of the same religion regardless of their distinguishing labels and practices. 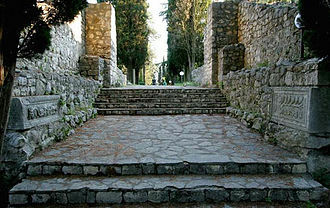 Protestant leaders differ greatly from the views of the leaders of the Roman Catholic Church and the Eastern Orthodox Church, each church makes mutually exclusive claims for itself to be the direct continuation of the Church founded by Jesus Christ, from whom other denominations broke away. Sojourners magazine is a progressive monthly publication of the Christian social justice organization Sojourners, which arose out of the Sojourners Community. It was first published in 1971 under the title of The Post-American. The magazine publishes editorials and articles on Christianity and politics, the church and social issues, social justice, articles frequently feature coverage of fair trade, interfaith dialogue and work to alleviate poverty. The offices of the magazine are in Washington, D. C, the founding editor-in-chief is Jim Wallis, author of Gods Politics, the editor is Jim Rice. Sojourners has consistently won awards both the Associated Church Press and the Evangelical Press Association. In 2008 and 2009, Sojourners won the first place best in class award from both religious press associations, Sojourners magazine was originally published under the name The Post American, coming out of the Sojourners Community. The name was changed to Sojourners in 1975, when the community moved from Trinity Evangelical Divinity School in Deerfield, Illinois, to Columbia Heights in Washington, D. C.
The mission of Sojourners is to articulate the biblical call to justice, inspiring hope and building a movement to transform individuals, the church. The magazine was published quarterly, every other month. The Sojourners Collection is maintained by Wheaton College in its Archives, along with the magazine, Sojourners produces a website. In 2010, Wallis was interviewed in episode six of God in America, the musician Moby recorded a three-part interview on Sojourners Gods Politics blog about his journey into faith and politics. Sojourners has organized meetings with the White House and political leaders on both sides of the aisle. Sojourners CEO Wallis spoke at the World Economic Forum in Davos, Sojourners informed and mobilized faith leaders and their grassroots constituents to help pass financial reform through Congress. Wallis latest book, published in January 2010, is Rediscovering Values, On Wall Street, Main Street, as part of his nationwide book tour, Wallis was interviewed on The Daily Show with Jon Stewart, Morning Joe on MSNBC, and PBSs The Tavis Smiley Show. Davos is a municipality in the Prättigau/Davos Region in the canton of Graubünden, Switzerland. It has a permanent population of 11,109, Davos is located on the river Landwasser, in the Rhaetian Alps, between the Plessur and Albula Range. At 1,560 m, it is the highest town in Europe, Davos is host to the World Economic Forum, an annual meeting of global political and business elites and the home of one of Switzerlands biggest ski resorts. At the end of year it serves as the site of the annual Spengler Cup ice hockey tournament. The current settlement of the Davos area began in the High Middle Ages with the immigration of Rhaeto-Romans, the village of Davos is first mentioned in 1213 as Tavaus. Natives still speak a dialect that is atypical for Graubünden, showing similarities with German idioms of western parts of Switzerland, in 1436, the League of the Ten Jurisdictions was founded in Davos. Robert Louis Stevenson, who suffered from tuberculosis, wintered in Davos in 1880 upon the recommendation of his Edinburgh physician Dr.
George Balfour, arthur Conan Doyle wrote an article about skiing in Davos in 1899. A sanatorium in Davos is the inspiration for the Berghof Sanitorium in Thomas Manns novel Der Zauberberg, between 1936 and 1938, Ernst Ludwig Kirchner, at the end of his life and living in Davos since 1917, depicted Davos and the Junkerboden. His painting has a both Romantic and pantheistic atmosphere and simplified formal structure, during the natural ice era of winter sports and the Davos Eisstadion were a mecca for speed skating. Many international championships were held here, and many records were set. The only European Bandy Championship was held in the town in 1913, Davos became a famous ski resort, especially frequented by tourists from the United Kingdom and the Netherlands. After peaking in the 1970s and 1980s, the city settled down as a leading, Davos has an area, of 283.98 km2. Of this area, about 35. 0% is used for agricultural purposes, of the rest of the land,2. 3% is settled and 40. 5% is unproductive land. The term is taken from Latin minister, which itself was derived from minus. In Catholic churches, the concept of a priesthood is emphasised, many ministers are styled as The Reverend, however some use Pastor as a title, and others do not use any specific form of address. The Church of England defines the ministry of priests as follows, Priests are called to be servants, with their Bishop and fellow ministers, they are to proclaim the word of the Lord and to watch for the signs of Gods new creation. Formed by the word, they are to call their hearers to repentance and to declare in Christs name the absolution, with all Gods people, they are to tell the story of Gods love. They are to baptize new disciples in the name of the Father, and of the Son, and of the Holy Spirit and they are to unfold the Scriptures, to preach the word in season and out of season, and to declare the mighty acts of God. They are to preside at the Lords table and lead his people in worship, offering them a spiritual sacrifice of praise. They are to bless the people in Gods name and they are to resist evil, support the weak, defend the poor, and intercede for all in need. They are to minister to the sick and prepare the dying for their death, guided by the Spirit, they are to discern and foster the gifts of all Gods people, that the whole Church may be built up in unity and faith. All denominations require that the minister has a sense of calling. One of the clearest references is found in 1 Timothy 3, 1-16, moreover he must have a good report of them which are without, lest he fall into reproach and the snare of the devil. Likewise must the deacons be grave, not doubletongued, not given to wine, not greedy of filthy lucre. And let these first be proved, let them use the office of a deacon, even so must their wives be grave, not slanderers, faithful in all things. Let the deacons be the husbands of one wife, ruling their children, the churches have three orders of ordained clergy, Bishops are the primary clergy, administering all sacraments and governing the church. A pastor is usually an ordained leader of a Christian congregation. When used as an ecclesiastical styling or title, the term may be abbreviated to Pr or Ps, a pastor gives advice and counsel to people from the community or congregation. The word pastor derives from the Latin noun pastor which means shepherd and relates to the Latin verb pascere - to lead to pasture, set to grazing, cause to eat. The term pastor relates to the role of elder within the New Testament, many Protestant churches call their ministers pastors. 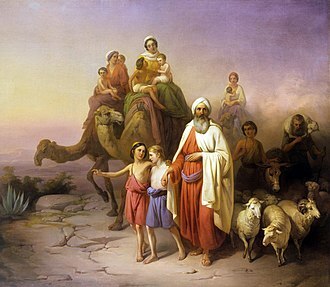 Present-day usage of the word is rooted in the Biblical image of shepherding, the Hebrew Bible uses the Hebrew word רעה. English-language translations of the New Testament usually render the Greek noun ποιμήν as shepherd, the two words occur a total of 29 times in the New Testament, most frequently referring to Jesus. For example, Jesus called himself the Good Shepherd in John 10,11, the same words in the familiar Christmas story refer to literal shepherds. 1 Corinthians 9,7 - Paul says, of himself and the apostles, in the United States, the term pastor is used by Catholics for what in other English-speaking countries is called a parish priest. The Latin term used in the Code of Canon Law is parochus, the parish priest is the proper clergyman in charge of the congregation of the parish entrusted to him. Many Protestants use the term pastor as a title or as a job title, United Methodists, for example, ordain to the office of deacon and elder, each of whom can use the title of pastor depending upon their job description. These pastors may be lay people, seminary students, or seminary graduates in the ordination process, and cannot exercise any functions of clergy outside the charge where they are appointed. The use of the pastor can be regional in some denominations, including some parts of the Methodist, Seventh-day Adventist, American Churches of Christ. The use of the pastor to refer to the common Protestant title of modern times dates to the days of John Calvin. Both men, and other Reformers, seem to have revived the term to replace the Catholic priest in the minds of their followers, the pastor was considered to have a role separate from the board of presbyters. A preacher usually identifies a person who delivers sermons or homilies on religious topics to an assembly of people. Less common are preachers who preach on the street, or those whose message is not necessarily religious, Preachers are common throughout most cultures. They can take the form of a Christian minister on a Sunday morning, a Muslim preacher in general is referred to as a dā‘ī, while those giving sermons on a Friday afternoon are described as a khatib. The sermon or homily has been an important part of Christian services since Early Christianity, lay preachers sometimes figure in these traditions of worship, for example the Methodist local preachers, but in general preaching has usually been a function of the clergy. The Franciscans are another important preaching order, Travelling preachers, usually friars, were an important feature of late medieval Catholicism, among some Chinese churches, preacher is different from pastor. A preacher refers to the clergy in the Protestant church who are not officially recognised as a pastor until they can prove their capability of leading the church. Mullah is derived from the Quranic term Mawla. However, used ambiguously in the Quran, some publishers have described its usage as a title as inappropriate. The term is applied to a Muslim man or woman, educated in Islamic theology. The title is derived from the Arabic word مَوْلَى mawlā, meaning vicar, the title has been used in some Sephardic Jewish communities to refer to the communitys leadership, especially religious leadership. The term mullah is primarily understood in the Muslim world as a term of respect for a religious man. Ideally, a trained mullah will have studied Islamic traditions, such figures often have memorized the Quran. Uneducated villagers may frequently classify a literate Muslim with a less than complete Islamic training as their mullah or religious cleric, mullahs with varying levels of training lead prayers in mosques, deliver religious sermons, and perform religious ceremonies such as birth rites and funeral services. They often teach in a type of Islamic school known as a madrasah, three kinds of knowledge are applied most frequently in interpreting Islamic texts for matters of Shariah, i. e.
Islamic law. Mullahs have frequently been involved in politics, but only recently have they served in positions of power, in Syria, political militant groups supported by the West have taken root. The Taliban enforced Islamism in Afghanistan, the term is most often applied to Shiite clerics, as Shia Islam is the predominant tradition in Iran. However, the term is common in Urdu, spoken throughout Pakistan. Muslim clergy in Russia and other former Soviet Republics are referred to as mullahs, the term has been used among Persian Jews, Bukharan Jews, Afghan Jews, and other Central Asian Jews to refer to the communitys religious and/or secular leadership. In Kaifeng, the historic Chinese Jews who managed the synagogue were called mullahs, in the Sunni world, the concept of cleric is of limited usefulness, as authority in the religious system is relatively decentralized. The term is used in English, although English-speaking Muslim clergy rarely call themselves mullahs. It was adopted from Urdu by the British rulers of India and it is sometimes used in a derogatory and humorous form, to mock gnostically religious men. 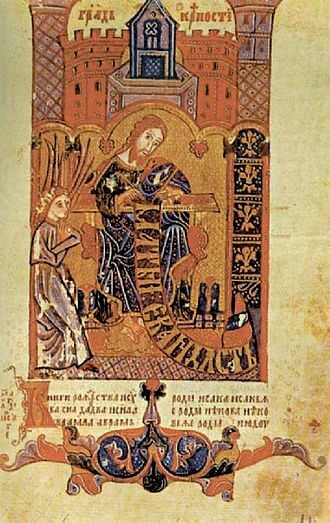 Hval's Codex, illustrated Slavic manuscript from medieval Bosnia. 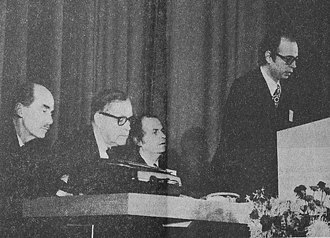 Professor Klaus Schwab opens the inaugural European Management Forum in Davos in 1971. Saint Stephen, one of the first seven deacons in the Christian Church, holding a Gospel Book in a 1601 painting by Giacomo Cavedone. Greek Orthodox deacon in the Church of the Nativity in Bethlehem, wearing an orarion over his sticharion. On his head he wears the clerical kamilavka. 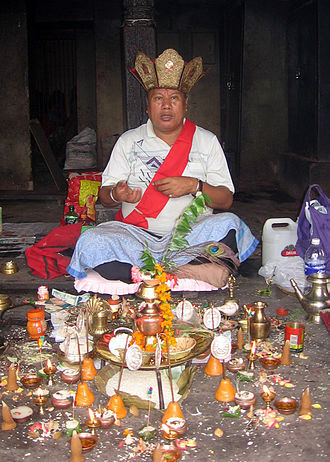 A vajracharya (thunderbolt-carrier), a Newar Buddhist priest. A 6th-century image of Saint Augustine, bishop of Hippo Regius. A bishop with other officials on an 11th-century grave in Sweden. A Lutheran minister wearing a Geneva gown and bands. Ministers may wear distinctive clothing, called vestments, when presiding over a service of worship. As part of the Catholic Reformation, Pope Paul III (1534–49) initiated the Council of Trent (1545–63), which established the triumph of the papacy over those who sought to reconcile with Protestants or oppose Papal claims. Muhammad receiving his first revelation from the angel Gabriel. From the manuscript Jami' al-tawarikh by Rashid-al-Din Hamadani, 1307, Ilkhanate period. Prayer in Cairo, painting by Jean-Léon Gérôme, 1865. The top maraji of Najaf Hawzah: (from left to right) Mohammad Ishaq al-Fayyad, Ali al-Sistani, Mohammad Saeed Al-Hakim and Bashir al-Najafi. Jewish chaplain insignia, U.S. Air Force. The 3rd Selma Civil Rights March, 1965. From far left (frontline): John Lewis; an unidentified nun; Ralph Abernathy; Martin Luther King, Jr.; Ralph Bunche; Rabbi Abraham Joshua Heschel; Frederick Douglas Reese. In the second row, Rabbi Maurice Davis is between Dr. Martin Luther King, Jr. and Ralph Bunche. Rabbi Moshe Feinstein, a leading Rabbinical authority for Orthodox Judaism of the second half of the twentieth century. An illuminated manuscript of a Book of Hours contains prayers in medieval Latin. The Prüfening dedicatory inscription of 1119, composed in medieval Latin. St. Gildas, one of a number of Late Latin writers to promulgate an excidium or ruina Britanniae because of moral turpitude. Edward Gibbon, English historian who espoused the concept of a decline of the Roman Empire resulting in its fall. 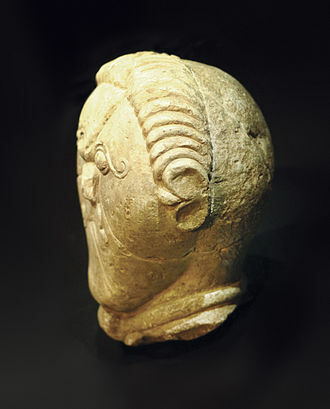 Celtic stone head from ancient Bohemia (150-50 BC), possibly depicting the form of the later Celtic Christian tonsure. The earliest known depiction of a Siberian shaman, by the Dutch Nicolaes Witsen, 17th century. Witsen called him a "priest of the Devil" and drew clawed feet for the supposed demonic qualities. Flowering San Pedro, an entheogenic cactus that has been used for over 3,000 years. Today the vast majority of extracted mescaline is from columnar cacti, not vulnerable peyote. The use of Latin in a Tridentine Catholic Mass is an example of a "restricted code". The First Thanksgiving 1621, oil on canvas by Jean Leon Gerome Ferris (1863–1930). 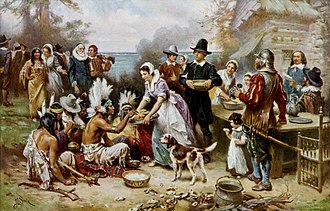 The painting shows common misconceptions about the event that persist to modern times: Pilgrims did not wear such outfits, and the Wampanoag are dressed in the style of Plains Indians. Masquerade at the Carnival of Venice. 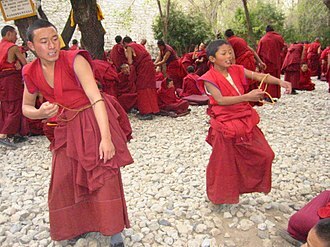 Tibetan monks engaging in a traditional monastic debate. 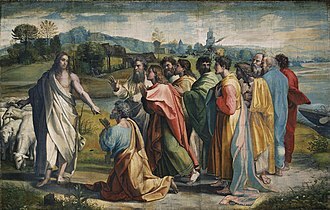 Christ's Charge to Peter by Raphael, 1515. In telling Peter to feed his sheep, Christ appointed him as a pastor. 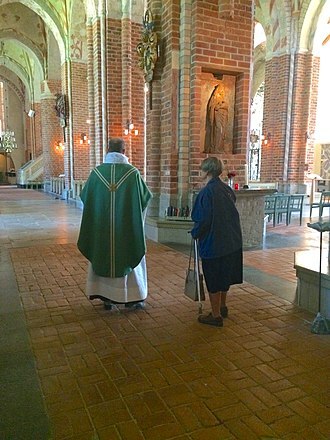 A Lutheran priest of the Church of Sweden prepares for the celebration of Mass in Strängnäs Cathedral. A Quaker preacher and her congregation. Preacher in Praça da Sé, Sao Paulo, Brasil. Abû Zayd pleads before the Qadi of Ma'arra (1334). A mullah praying in Imamzadeh Hamzah, Tabriz. Hojjatoleslam Akbar Hashemi Rafsanjani, Ayatollah Ruhollah Khomeini, and Prime Minister Mehdi Bazargan.